After the rigors of yesterday's trip into the mountains, we get off to a slow start. The kids sleep in, we linger at breakfast with Omi Marga, and only in the middle of the day get on to the business of going somewhere. 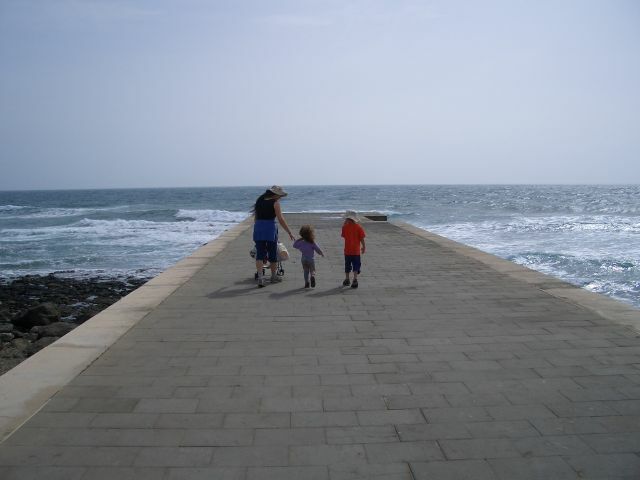 We decide on the kids' favorite, Maspalomas, and the kids' favorite mode of transport, the bus. Here we are at the centerpoint of the Maspalomas promenade. 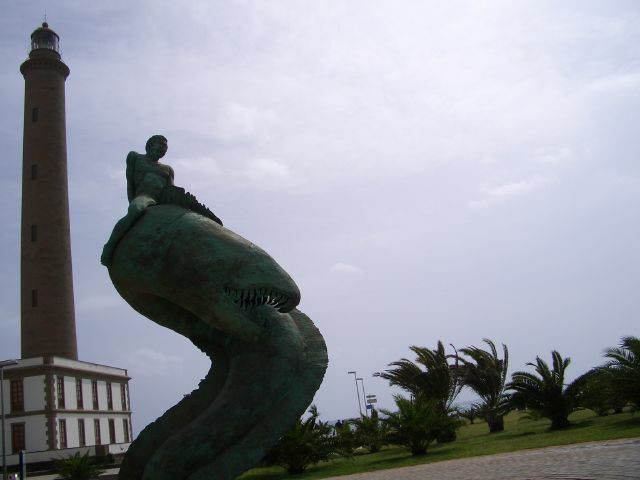 To our left is the Faro de Maspalomas, the lighthouse, and a statue of someone riding a huge moray eel. To our right, blessedly out of view, is a terrifyingly commercial walk in front of sanitized cafés and tiendas, serving and selling generic holiday fare and souvenirs. We stoll out to the walkway which juts out from the Faro. Even at high tide this doesn't seem useful to boats, so I suspect it's completely for show. It's a great vantage point, and if the wind weren't blowing so hard it would be covered with sunbathers, photographers, and artists. Today we have it to ourselves. This is my favorite photograph of my family so far. 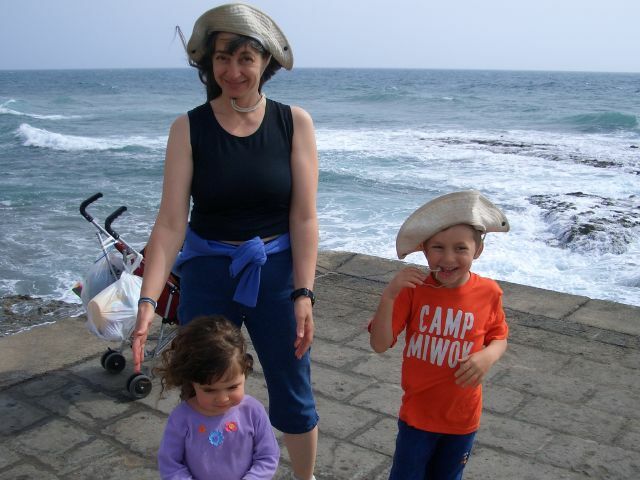 Especially the bending of our Ranger hats by the aforementioned wind. 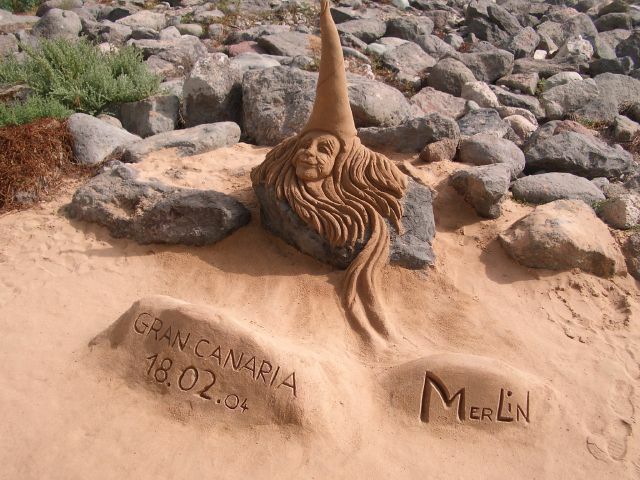 The sand-carving artist didn't take the day off, to our surprise and pleasure. His daily offering was a Merlin with an improbably high hat. I wonder how he gets the sand to stay so well compacted. Sugar water, perhaps? Isaac really took to clambering all over the rocks, fraying our nerves. (Of course, I did the same thing to my parents during an early 1980s trip to the Gaspe Peninsula of Canada and Monhegian Island.) 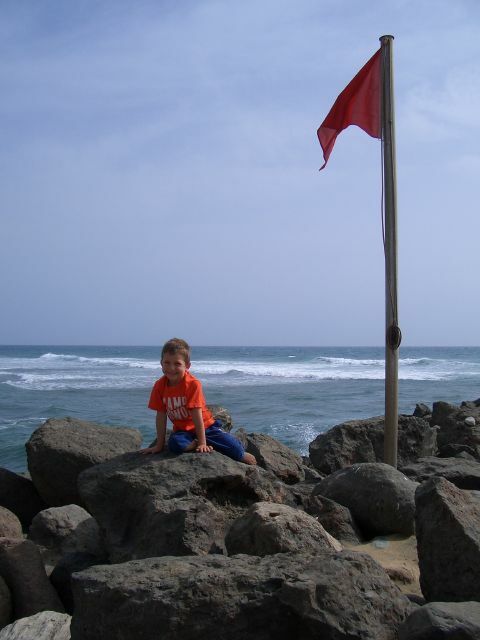 The red flag being flown is a warning to swimmers that the conditions are hazardous. Lila really took to the climbing structure for the first time. 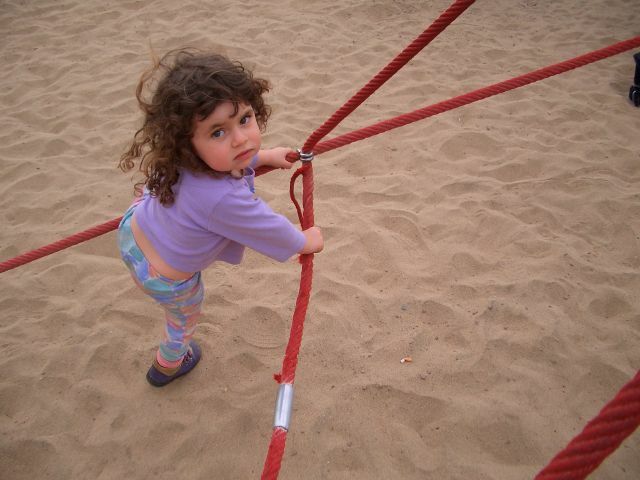 Starting from the sand she made it almost two meters up on the bouncing red ropes. We were all impressed. She's also become a jumper, diving off beds, stone walls, and anything else she can find which will give her some height. Tomorrow, see why we're wearing plastic bags.